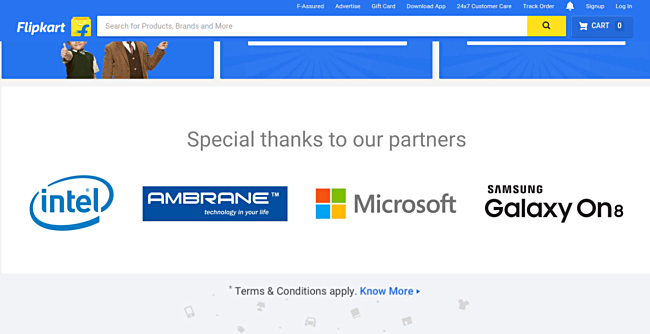 Flipkart – one of India’s top e-commerce marketplaces – is gearing up for its annual Big Billion Day sale event, and as part of it, the company has put up a dedicated page for the event on its website. As you’d expect, the page contains all the essential details related to the event, but what caught our attention is the ‘Samsung Galaxy On8’ moniker that appears in the Special thanks to our partners section. This is possibly the first time we’re hearing about a Samsung Galaxy On8, and with Flipkart listing it as partner strongly suggests that the device will be available for purchase at the retailer’s upcoming flagship sale event (scheduled for Oct 2 – Oct 6). It’s worth mentioning that Flipkart has recently been teasing a Galaxy On phone with Super AMOLED full HD display. So, it’s quite possible that the device being teased is the Galaxy On8. Anyway, this comes shortly after Samsung launched the 2016 edition of the Galaxy On7 in China. The company also teased the Galaxy On5 (2016) on its official China website, revealing few of its key specs. Thanks for the tip, Saiju P J!! !.